I ran a short session workshop at Digital Shoreditch, a very low-fi session with the aim to understand how do we Design For The Good Life. What does the Good Life look like? How do we manifest such values towards more sustainable ways of living in our creative practcices, interactions with clients and end consumers or users. Through a dynamic and collaborative process the group explored, reflected, and critiqued a number of diferent expressions of how notions of the Good Life might be manifested. The communication design research is practice-oriented and in collaboration with a selection of sustainable food initiatives - an example of a thriving sector for social innovation. The aim is to extract from these a set of practices that reveal how sustainability “values” and “qualities” are expressed through communication design approaches. 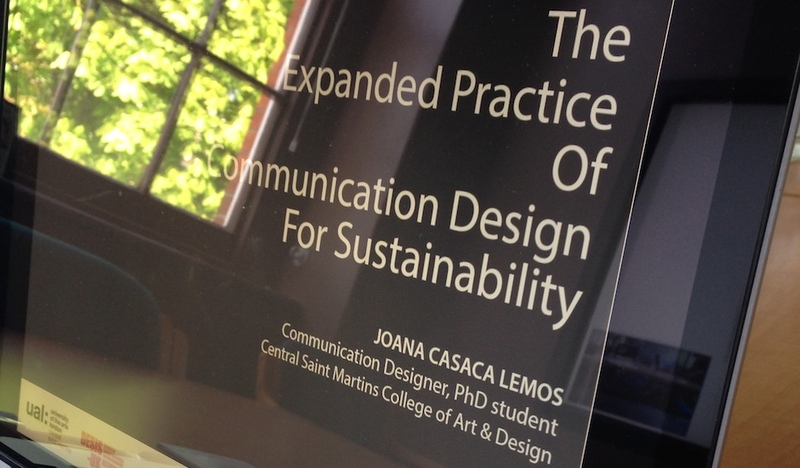 Communication design is interpreted as an expanded practice of message, form, interaction and experience, essential in leveraging social change towards more sustainable ways of living. Presented here is a fragment of the ongoing research. Extracting meaning from informal conversations with sustainable food initiatives, to map what are sustainability qualities and values. It was my first experience presenting a paper at a conference. The unsettling nerves of such an event were easily overcome by the friendliest environment I could have hoped for. The National Institute of Design in India is a warm and welcoming institution, making its way through establishing design research in academic programmes and working on setting up a doctoral research degree. It is a place where it is ok to make mistakes. A place where sharing ideas and knowledge openly is extremely welcome with a positive feeling of constructiveness. In a room of about 50 people there were few research students, most were career researchers at different institutions or design professionals. This was an interesting audience for what I was had to present. I felt that my presentation was generally well received. Although I was left with the feeling that it was imperfect, that for as much as I prepared there were points I did not reenforce enough on the spot. I spoke freely about my paper and tried to articulate straightforward in a language that would be easily accessible. This was a good challenge for me. It became clear that it is better to articulate one thought well, than several thoughts unclearly. The experience had me reflect on one aspect which is regarding cultural context when presenting my work. There was one particular slide showing an image of a food project, where a message with a funny pun that in the UK and other european countries would be understood as so, however in this context it was not so clearly understood. It made me realise how in my research some of the messaging I am analysing is very tied to the local contexts. This is something I need to consider and look into more. However these local stories is also what gives richness to the research that I am doing. Some of the points that stood out to me from the presentations. Jane Pavitt of RCA elaborated the notion of ‘what is it to be a designer?’. That we have moved away from a design practice focused on consumption to one focused on systems - We have moved from a focus on materiality to one of agency. A standpoint that as a communication designer I reenforce in my practice and philosophy. Roberto Fraquelli of Plymouth University presented an approach to design thinking that is much aligned with my research - Holistic Deisgn Thinking with respect to deep (design) ecologies. With a strong interest in systems thinking, he has collaborated with Fritoj Capra and developed a specific methodology to design which focuses on the eco-centric. He elaborated the notion that there are parts of design which are random. Hapennings within the design process that we cannot have full control of, much like in the natural world. In design there is not always a logical decision making process. Intuition, empathy play a big role in the process of making. the space between Design and Art is The Nothing. Martin Heidegger, ‘What is Metaphysics?’ in Basic Writings: From Being and Time to the Task of Thinking. Edited by David Farrell Krell. (Wiltshire: Taylor & Francis, 1978), 95-6. A thought I am developing through my research. My research touches intangible qualitative data, although approached through a design methodology, which can be argued to be 'scientific'. Although I struggle with that. I struggle with that because the space between design and art is that, design as a science does not allow space for the immaterial, as art does - the nothing. The nothing is the space where you experience, nothing. You experience awareness. You experience the viscocity of time. Sustainability is to care. You need to care to be sustainable. Sustainability is about caring that something is a part of you. Why this, why now, and why not something else. A reflection on my research interest and its relevance to contemporary practice. The interest for proposing and conducting this research project at academic level grew out of a need found in practice whilst working on the communication design of social enterprise Doi Tung in Thailand in 2011. As a communication designer, I felt that my expertise and skills tailored mostly to design within market-driven contexts were not entirely applicable to the particular scenario I was dealing with. Working in such a space required a more specific understanding of how communication design should be addressed within projects of social innovation for sustainability. How it could play a significant role in the process and not as a last stage of ‘image-making’. 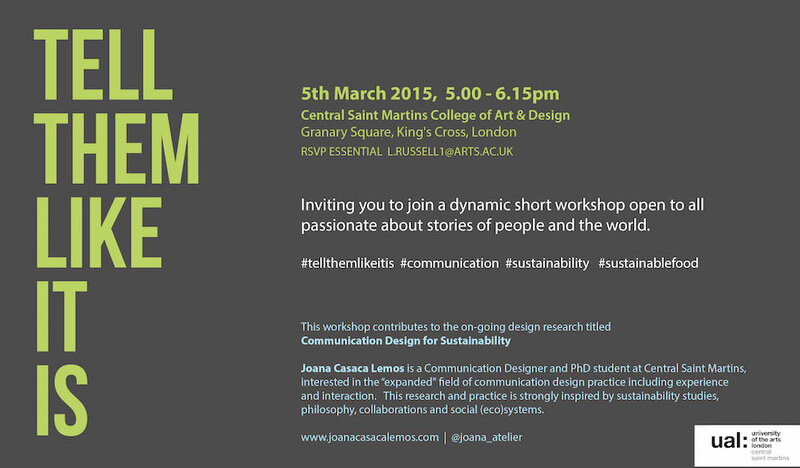 At the time of writing an initial PhD proposal, guidance generally available and accessible to communication designers interested in this sector focused greatly on how to make their practices more sustainable, e.g materials and production as ‘sustainable communication design’, or on how to better ‘communicate sustainability’ information, such as traceability of supply chains through visualisation. It focused greatly on the outcome product of communication design and not the process of designing communication design in this very interdisciplinary space. Since then and over the last three years we have seen great development in the areas of design for sustainability, design for social innovation and a growing interest in systems thinking, also within communication design. Some of this knowledge has gone beyond academia and become more widely available for designers to apply in practice. As this PhD develops through time within the fast-paced research environment we work in, communication design within social innovation and sustainability will undoubtedly gain importance and momentum. However, today, I find that specific knowledge on this subject is absent. More specifically, and regarding the questions this research addresses, what I find to be absent is guidance relating to the ways in which the development of the communication design itself can catalyse participation in initiatives of social innovation for sustainability. The initial question proposed for the PhD project in this specific context addressed how communication design might generate more empathy between the producers and consumers within a given social enterprise. This question emerged out of the challenge I had faced in my practice. However, as the academic research developed in the first year of the PhD it became apparent that empathy was an underlying subject and should not be the focus point of the academic investigation. Generating empathy is one of the mechanisms employed by communication design, clearly seen in many social and environmental campaigns. Questioning empathy in itself would not answer the primary proposition of the research nor contribute to knowledge in the field of communication design within social innovation and sustainability. Having a good understanding of the wider contemporary landscape of sustainability communications, the research came to a point where it was important to identify what area it would be conducted in, who exactly where the producers and the consumers. One of things I learned from my valuable experience with the Doi Tung project was also one of the main challenges at the time. The coffee produce of Doi Tung is its main income and also the one product which the community is extremely proud of. My struggle at the time faced creating communication design ‘experiences’ that would clearly convey this passion of the producers for their coffee plantations (and therefor generating empathy with the consumer). I lacked the skills and tools to articulate through communication design the importance of the biological understanding and relationship between coffee producers to their environment. Their relationship to their ‘material’, the soil and the trees, was a different kind of relationship from that of the ceramic artisans and silk-weavers to their raw materials. The poetics of food growing was extremely difficult to “communicate” through other than “to experiencing it yourself”. Somehow it seemed quite important to explore this because thinking around food allows for a better understudying of what sustainability is, the networked and interconnected systems we inhabit in and contribute to. To situate this research further, from the beginning there was a predisposition to ally it with small-scale initiatives. Perhaps given my background and experience as a designer with small-scale projects, local brands and social enterprises are what is most familiar to work with. In this sense, the research never intended to look into or collaborate with large-scale sustainable brands or established fairtrade organisations although it acknowledges many of its best practices in communication and strategy. Another relevant point in this sense is the cultural context of the research. It was questioned whether it should focus on emerging and “developing” markets (given my experience with Doi Tung in Thailand) or whether to focus on “developed” markets such as the western context. The questions asked in this research could have been investigated within both scenarios and have different outcomes. Whilst looking into design and social innovation I noticed the apparent interest in the food sector particularly within the urban environment. Food access being one of the key challenges for sustainable development of the urban context, it is an area that is being researched by many designer researcher across the western world. I came across the recent research on alternative food networks and the different types of initiatives which support a sustainable development of urban food provision and culture; such as local farmers markets, box delivery schemes, food surplus innovations, community supported agriculture. Another aspect of this growing dynamic sector was the interest in the social implications of these upcoming food initiatives; how they contribute to general wellbeing, social cohesion and even an economy of happiness. With much ground to explore in terms of possibilities for communication design research this became the chosen area for conducting this project. In the same way that atoms live microscopically, some stories can live unnoticed if not placed under a lens. This is the case of many emerging initiatives that promote sustainability across industry sectors worldwide. In this space the designer plays a determinative role to magnify and frame essential stories of this world in constant transformation, stories which are often shy in their nature, imperceptible and on the periphery of mainstream. Storytelling as a method in design has gained large momentum over the last decade. Frameworks, media and technological advances are vastly explored, whether to communicate complex information through narrative and visualisation (Lankow, 2012; Klaten, 2011) or to engage actors in systems, interactions and experiences (Erickson, 1996; Brooks, 2010). However, with the purpose to understand how the designer himself plays a role in listening and telling the story of things on the edge of the mainstream, the unconventional or unfamiliar, I will take a step back to reflect on the purpose of the art of story-telling and of story-listening. Storytelling is more than a method. It is a universal ancient means of education, cultural preservation and way of imprinting moral values across societies and generations. Stories have allowed us to travel both back in time and forward in the future. For a story to exist it requires a time and space, a plot, characters and a narrative voice. The experience of storytelling is vested in the narrative that is, both told and listened. Throughout history, stories have unlocked the potential to aggregate common beliefs and move people to create communities of shared interests. This is still true today, however through very different means and for very different ends. Technology, communication and connectivity has allowed for the constant telling of stories, embeded in the mundane, through complex multiple layers of time and places. Regardless of the technological advances, it is still through storytelling that in fundamental everyday life that we make sense of our existence and our contribution to the wider world. In the current times of abundance for initiatives promoting more sustainable ways of living, designers play a key role in deciding what stories and details are brought into actuality – what to magnify, what to talk about. The designer as a maker is a native explorer of the world equipped with the tools to discover the most interesting stories in society. However, each designer is also an individual with a background, unique point of view, beliefs and motivations, which inevitably shape the way a story is told and how others take part in that vision - imagining the way things are, were, or could be. I understand this diversity of voices to be a positive trait, a collective of rich potentialities that can feed into each others’ narratives and build new ones. I further illustrate this point borrowing from Walter Benjamin’s perspective on the nature of storytelling. In the late 1930s, in his seminal essay “The Storyteller” Walter Benjamin expressed a deep concern for the oral tradition of storytelling coming to an end. He feared that “experience of value” was decreasing as a consequence of Modernity; technology, industrialisation and new forms of social organization. Storytelling was being replaced by The Novel. Although both narrative formats, the ultimate difference between the two can be paralleled to the difference between speech and writing, voice and text, fundamentally presence and absence. The novel is seen as a solitary experience of the reader, whether storytelling is understood as a participatory and collective experience. The purpose of storytelling is inspiring others through the embedded moral of the story - or “the experience of value”. In this perspective, what distinguishes the storyteller from others who tell narratives (such as the novelist) is that the storyteller tells the narrative from experience - whether his own or that of others - and in the process it becomes a shared experience of those who listen. In this sense, when telling stories of unconventional sustainable behaviours, the storyteller (the designer) has an imperative position to bring about positive human value because “traces of the storyteller cling to the story the way the handprints of the potter cling to the clay vessel”. This is why the capacity of the designer as a lens is extremely valuable. Through correctly amplifying positive aspects of unconventional sustainable behaviours in a designerly, compelling and engaging way, it guides the listeners to understand why these sustainable behaviours exist and why they matter. The role of the designer as a story-listener is equally important to that of telling the story. As a lens in the world, the designer needs to be participative and present because people ultimately are the milieu of the craft. These qualities are true of designers working within social innovation and sustainability, a fertile ground for stories of unconventionality. Throughout time we have been fascinated by stories of novelty; tales of unsung heroes, of travellers in journeys from far away places, of epic places where history was made. As Walter Benjamin recalls, the best stories are “embedded in rooms in which people have died, or rooms where people have been born”. Hence, the elements of uniqueness that memorable stories are made of, can be found on the fringe of the mainstream. On the contrary, I believe it is emerging. We have not lost the ability to exchange experiences. Considering the growing number of social innovation projects inspiring values towards a sustainable good life, the art of storytelling is now extremely important to transform and leverage the audience formally known as “passive listeners” to become “active tellers”. Erickson, T. (1996) Design As Storytelling. interactions. [Online] 3 (4), 30–35. Benjamin, W. (1968) The Storyteller: Reflections on the Works of Nikolai Leskov in Illuminations. 2. Vol. 241. Random House LLC. Lankow, J. (2012) Infographics: the power of visual storytelling. Hoboken, N.J: John Wiley & Sons, Inc. Klanten, R. et al. (eds.) 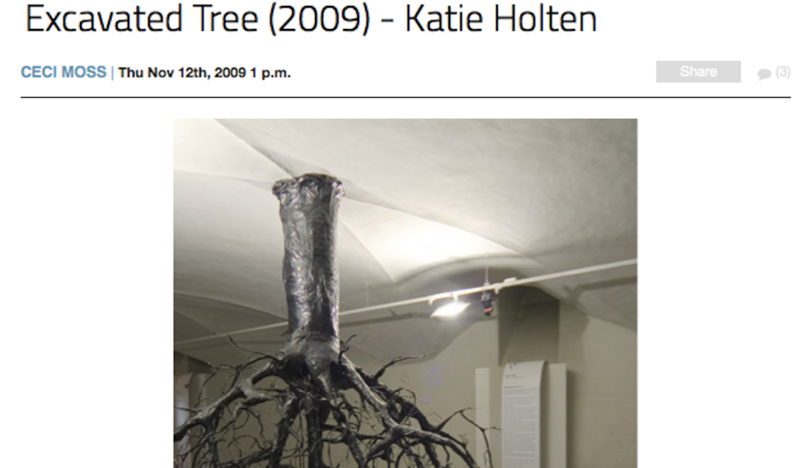 (2011) Visual storytelling: inspiring a new visual language. Berlin: Gestalten. Rukeyser, M. (2005) The Collected Poems of Muriel Rukeyser. Pittsburgh, PA: University of Pittsburgh Press. Quesenbery, W. & Brooks, K. (2010) Storytelling for User Experience: Crafting Stories for Better Design. 1st edition. Brooklyn, New York: Rosenfeld Media. Common Cause Values and Frames - Arts + Culture how the community of practice has worked worked? how are the values embedded into practice by practitioners? how are the values measured within artworks ? do the values generate engagement and participation of the public ? Visions of the Future - something we have all be discussing recently is how vision of a more sustainble future inspire the way in which we design today. Several authors have elaborated on this. Whether through a design approach that is deeply rooted in the natural world and human co-existence with biodiversity and systems, or speculative design approaches through working with the facts we have today to project technological advances in the future, or even, further speculation as to acknowledge things such as the singularity movement as a reality for the future. "How can people with widely varying backgrounds, expertise, and worldviews come to a shared vision of the future? How can we work constructively with the problems our society faces that defy analysis and demand that we learn our way together into the future respecting both our knowledge and our ignorance of what to do?" This week I was invited by Forum for the Future to test out some of my research insights on a workshop with the Future Shapers - a community of young entrepreneurial people exploring people-driven innovation towards sustainable development. In this workshop, four future scenarios of 2050 were presented and the participants were invited to creatively think about how their own enterprises, practices and personal selves, might evolve given the future context. I was challenged by Forum’s Futures team to think about how through my understanding of communication design as an expanded practice we could engage participants in a more ‘experiential’ understanding of the abstract and complex 2050 scenarios. How can communication design prompt an understanding of complex future scenarios? Making sustainability personal Each participant was informed to bring a meaningful object with them. These were minimalistic things of the everyday. An object which represented something they care about and would like to preserve into the future. Regardless of the what the object was (we would expect some commonalities such as references to the environment and family) its role was to help personalise the experience and tap into details that the participants themselves recognised and could identify with. This allowed for stream of thought, however in a simple way, about how citizen-driven innovation strategies might help preserve this meaningful object and what it implied. The everydayness I looked to take advantage of the mundane details which are part of the everyday and can sometimes be disregarded as opportunities to communicate a message. The lunchtime period, which is usually a great space for participants to interact with each other and converse, was seen as an opportunity to bring to life some of the aspects of the 2050 scenarios concerning food. Small tags with messages were inserted into the food plates. These messages were tailored to specific food related issues that may arise within each of the four future scenarios. The participants were then invited to pick out food according to the future scenario they had stepped into. We must here acknowledge the intended contradiction between the messages on the tags and the food displayed. However fictitious and playful, this small detail came across as somewhat unexpected, fulfilling the objective of enhancing the experience - it seemed to be a conversation starter. The millennial generation (i.e. under 31s) will find value in the sense of community, rather than as previous generations that valued material possessions. This generation will define freedom as transparency and openness and ability to be embedded in communities. It will aim to be open transparent and collaborative. Power will be distribuited laterally. We should not dream of utopias because they are perfect and we humans are not perfect. But rather live in an empathic world, root each other on and balance each other out. Presentation at Forum for the Future Forum gave me a great opportunity to present my research and interests during their lunch hour, as part of their ‘brown bag lunch’ talks series. It was the first time i presented my work to a non-academic audience, and my main challenge in drafting this presentation was to keep it visually engaging and in a simple language. Although this audience in particular is an expert of ‘sustainability’ i felt it would be good practice to explain ideas in a clear manner. I focused on two points; what might be interesting for Forum to learn about my work, and how they could help me in the development of my project. The plan was to give a 30min presentation and conduct a group activity afterwards, of ploting their insights into my axis system. I created two polar axis of “dynamic process of sustainable development” and “expanded practice of communication design”. The idea here was find links between the two concepts, commonalities and diferences in interpretation and approach. Although this didnt take the format of the visual exercise initially planned, the conversation still happened. What are the principles behind the dynamic process? how is it diferent from dynamic processes for wrong-doing (ie shipping kids to factory exploitation)? It is a 10 year old definition but it is starting to come back into the current language of forum for the future, given that they are working so much within systems thinking. When you intervene in a system, you need to interveen in diferent places, and the hard part is understanding what are the unforseen consequences. You assume that you are doing it for a good reason but you dont know what might happen as a consequence in 5, 10 years time. How can you prepare for this? Does communication design have a role preparing for the unintended consequences? A common point between all the examples i showed of alternative food projects, empathy seemed to be a link, people making connections and stepping out of the patterns which our western society has given us, and has worked so hard to develop - to be independent, to go on a holiday but not actually meet anybody. So these alternatives are about creating unusual connections and conversations that would not otherwise happen, and establishing a sense of knowing not just through your head but through the senses and phisical experience of walking through a speace. Brining things all the way down. This is the beginig - brinigng people together - but the process of bringing people together gets that going, but what happens when they leave, how do we create an on-going process? How can we think about the role of communication design , not just strating the conversation, but supporting the longevity of the conversation through time? How about the on-going process not just bringing people together? Food is accessible to everyone, it is a sensorial good as well. But in the case of energy for example, people are far removed from where energy is created, it is not a tangible good. So how can we get people together and experience the production of energy? The Energy Coallition project has done this, where it took people together to co-produce energy for their community. The real challenge of communication design is not reaching the audiences that already take-part in the sustainability dialogue, but to reach the people that never heard of it. How to draw them? how to reach for the audience that might not look for it? This is what Forum may consider to be the un-tapped part of communication. "The important thing is to understand life, each living individuality, not as a form, or a development of form, but as a complex relation between differential velocities, between deceleration and acceleration of particles. A composition of speeds and slownesses on a plane of immanence. "Gilles Deleuze, Spinoza: Practical Philosophy, trans. Robert Hurley (San Francisco: City Lights Books, 1988) 123. Carla Cipolla is associate professor of the Production Engineering Program of Coppe / Federal University of Rio de Janeiro and is also a founding member of the DESIS Lab there. Her research and design activities focus on service design and design for social innovation, emphasizing international cooperative and comparative projects of relevance to specific Brazilian issues. She coordinates a DESIS Network thematic cluster called Informal, Formal and Collaborative (IFC) that aims to identify potential ideas for a new generation of services that could be designed from the underserved communities’ perspective. Service based on total use of vegetables and fruits (including skin/peels, generally considered as waste) to prepare buffets, teach how to cook and to create home gardens. Regina Tchelly cooks since she was 15 years-old. Eleven years ago, she decided to leave Paraíba, northeast of Brazil, to live in Rio de Janeiro, looking for better conditions of work. Her dream was always to become a restaurant chef. When she arrived in Rio, she went to live in the favela da Babilônia, south zone of the city. She started to work as a house cleaner. With the money she saved, she decided to start her own project.